In this day and age, upon hearing the term RPG, we automatically associate it with an often-lonesome single-player interactive story, or a massively multiplayer romp where you team up with other players from all-over to gain EXP and loot. Both, of course, pertain to videogames. Long gone is the imagery of a group of friends sitting around a dinner table—littered with pencils, sheets of paper, and source books—as they throw around dice and play out scenes using their imagination. Our RPGs are now more commonly presented through a video screen, rather than good old-fashioned pen, paper, dice, and a creative mind. However, video hasn’t totally killed the tabletop gaming star. It’s not like it was also able to do that to radio, right? One can never really destroy the truest form of an RPG. 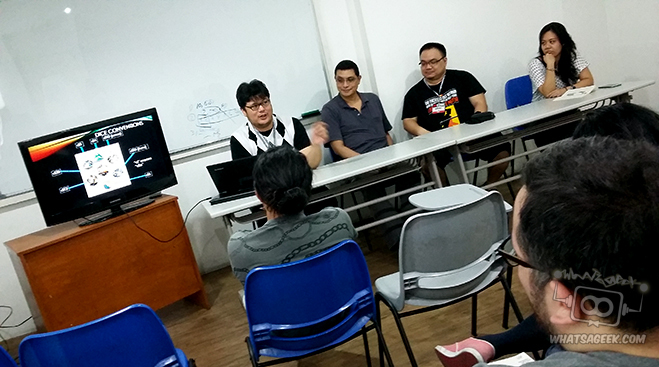 Worldwide, the popularity of RPGs is kept alive by passionate individuals and gaming groups. 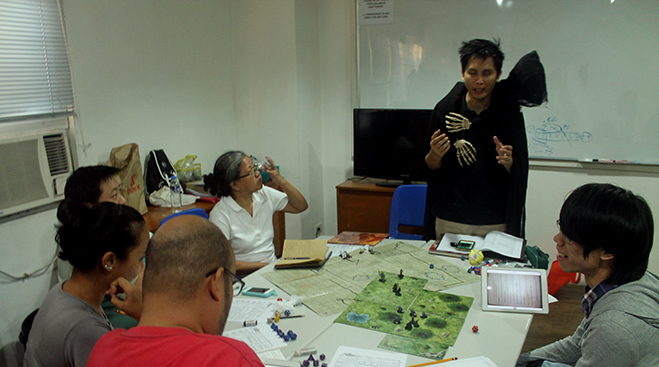 The Philippines has such a group in the form of Gamers and GMs (G&GM), whose purpose is to introduce, and sometimes re-introduce, traditional tabletop RPGs and other related games to players old and new. 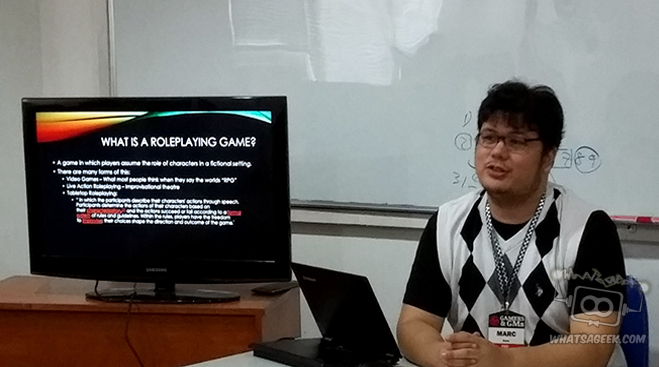 Marc Reyes (top photo), President of G&GMs, and other members of the organization presented a brief introduction to tabletop RPG systems and shared roleplaying tips fit for each. According to Marc Reyes, President of G&GM, they felt that many players are intimidated to start playing tabletop RPGs, due to the impression that there are a lot of complex and archaic rules involved. Older players, who went on gaming hiatus and wish to return, also feel the same because they think that they are no longer updated as the rules have changed so drastically that they may not be able to reintegrate themselves into what is current. “Yes, we acknowledge that there is somewhat of a barrier to entry [into RPGs],” Marc explained. “But we hope, through [G&GMs’] activities, we can tear down those barriers and encourage more people to play,” he continued. 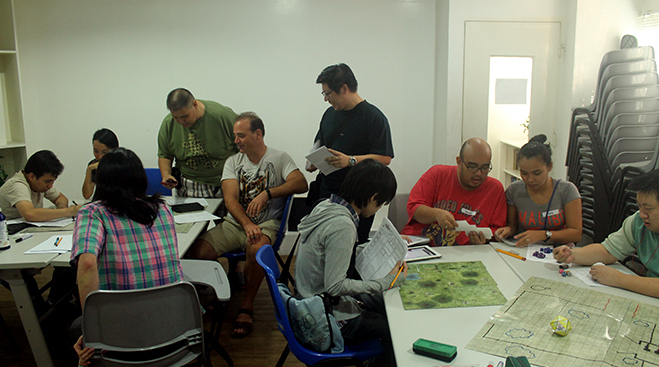 Recently, What’s A Geek was invited to G&GMs’ monthly RPG mini-convention at Makati B&B, at the second floor of Pamana Building along Arnaiz Avenue. It was an intimate gathering of players and game-masters where they held tabletop sessions on various gaming systems, as well as introductory talks and/or panels to get newcomers started. “[G&GM] organizes this mini-convention every month, and we always try to have something for both the veterans and the newbies,” Marc explained. “We hold games and sessions fit to the theme of the month; obviously, it’s horror for October, so most our line-up of games is under that genre,” he continued. Through the G&GM convention players and game-masters can learn new systems, share storytelling and roleplaying tips with each other, or just plain and simply hangout with other RPG enthusiasts. The organization started holding its monthly mini-conventions in January 2015, and has been increasingly becoming the go-to gathering for all things RPG. Due to the hype on Star Wars: The Force Awakens, the next convention, to be held on November 29, 2015, will feature Star Wars-related games and talks. For more information on Gamers and GMs and announcements on their activities, you may visit their official Facebook page.